Stop Writing Letters The Hard Way! You've Just Created A Powerful, Money-Making Sales Letter! Totally New & Updated Instant Sales Letters® 2.0! 19 complete website sales letter templates with fully customizable homepages, graphics, alternative headlines, opt-in offers, guarantee pages and full website navigation plan! How much is one good sales letter or powerfully written web site worth to your business? Imagine...one letter could bring you tons of hot leads and new customers, get them to keep buying over and over again, reactivate 'lost' customers, and even provide you with a constant stream of referrals. So anytime you need more business - you simply turn the tap on... it's like having the goose that lays the golden egg. Well, it isn't if you have the right tools. You see, dollar-for-dollar, nothing provides a better return on investment than direct mail and it doesn't matter what product or service you sell. Think about it. A sales letter or sales web site is the most powerful employee you could ever hire. It will relentlessly go out and deliver your message perfectly, every time. It will never call in sick. It will never complain. And it will never quit on you. Simply put, a powerful sales letter is like having a little automatic, money-making robot working for you, tirelessly...day and night. It could take you years and can cost you a small fortune to figure out just the right combinations that make some sales letters work - while others fall flat on their face. In just 2 1/2 minutes you can fill-in-the-blanks of these simple (yet extremely powerful) sales letter and website templates instead of staring at a blank piece of paper. Fact is, over 25,000 business owners and entrepreneurs have successfully used the original Instant Sales Letters® based on proven marketing principles and psychology. And they continue working because we still get testimonial after testimonial about their results BUT that's not good enough anymore! We've provided a serious update to make them even more powerful than ever with new online web templates. Maybe you're a sales rep looking to attract more leads...no problem! Just click on the Business to Business folder and you'll instantly have access to a powerful lead generating letter that pulls in qualified prospects like paperclips to a super-charged magnet. Never cold call again! "Yanik, I absolutely love these letters, this package FAR exceeded my expectations. I was very reluctant first because I've seen some packages of business letters and they were bad - some of them very bad. There are some books with letters that are horrible, a while ago I had a computer program Top Producer (for realtors) and there was a selection of sales letters - I wouldn't dare to send any of those letters to my prospects then, they sounded like canned letters and one could spot it right away. Yours are excellent, brilliant, just as doctor ordered. Dynamic, smart, with a rhythm...! It is so easy to use, it is mind boggling - I like especially your joint ventures proposal letters, they are fabulous." Perhaps you own a retail store and want a quick way to increase your business? - Easy! Click open the Retail folder and you'll find a letter guaranteed to produce an immediate "cash surge" whenever you want. Are you a professional? Well, you'll get an entire folder, filled with letters to generate more referrals (without asking in the office), reactivate old patients/clients, introduce new services and lots more. Any physician, chiropractor, dentist, accountant, lawyer or veterinarian can use these letter templates to quickly and easily grow their practices. "The best letters I have read. I have gone through a few other templates and suggestions by other people, no one impressed me so much." Or do you operate a service company? Then you've got it made. Inside your folder you'll find letters guaranteed to sell more of your service, spur referrals and even gather powerful testimonials. 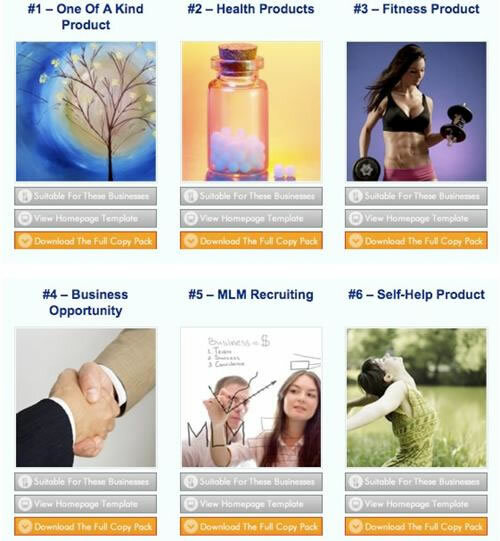 There is even a new section devoted to Network Marketing and Business Opportunity templates. I can promise you these definitely are not the same stale letters you see flying around all over the Internet. Or perhaps you sell our publish content and information. We got you covered too! Perfect for ebooks, manuals, membership sites, etc. Inside this section, you'll find the proven sales letters that are the workhorse of any direct marketing company. They're based on my proven sales letters that have generated millions in sales. But get ready for a shock. These sales letters are unlike anything you've ever seen before. If you're expecting some boring collection of business letters, like those available at any bookstore or on a CD-Rom, you've got another thing coming. You won't produce sales using those outdated, boring letters -- with their stodgy writing: "In reply to your letter dated... and pursuant to... and wherein... blah...blah...blah"
These letters may get you an 'A' in English class — but I can guarantee you they'll never sell any of your products or services! "Was starting to think that your methods wouldn't work for my business, but I sent out some emails written using your style and methods and the head of a new program wrote me this: "Would you consider writing a few ads? You're really good." SO I GUESS IT DOES WORK FOR MY BUSINESS!" "Your sales letters are amazing. I can now set up a sales site in minutes. Though I can write good sales letters myself, I really dislike doing it and it takes me days to write just 1 letter. Now I don't have to worry about it." "I have used you templates many times since purchasing the product some months ago. While I have spent over 20 years in sales and marketing, I was really shocked at how poorly my letters and ads were compared to the ideas you teach. Now I know why I would only get the minimum response rates." "I have just begun using your instant sales letters for my business. I used the testimonial request letters and got a great response rate for the fax back testimonials." "But I Can't Write" or "I'm Not Creative"
Actually, that's the whole point of these sales letter templates. Even if you can't write a grocery list and if you don't think you have a creative bone in your body -- you can still create powerful, profit-producing sales letters just by filling in a few simple blanks. It really couldn't be any easier unless I put the stamp on for you. That means, in about 2 painless minutes, you'll have a sales letter ready to go...without writing! A full website navigation plan (and you get detailed instructions for customizing your copy. You'll get unlimited access to our massive collection of copy templates -- written by professional copywriters, ready for you to "copy, paste, & customize" for your own private marketing needs. For businesses selling non-prescription remedies for common conditions such as memory loss, insomnia, jet lag, acid reflux, migraines, aging, anxiety, and so on. For businesses selling a training system (book, DVD, online videos, etc.) for people who wish to start a business or make more money. For people offering coaching or training services. For those who sell marketing services to businesses, such as web design, copywriting, SEO, and so on. For businesses selling seats at educational seminars and training events. For businesses selling subscriptions to any information product (newsletter, magazine, etc. ), offered online OR offline, for a monthly or annual fee. For businesses who sell memberships to private, online communities and membership websites. For local retail stores seeking to create an online presence. For websites selling a wide range of products that fall into a tightly related category (i.e. dog toys, puzzles, gift baskets, etc.). For local service-based businesses targeting consumers (wedding planner, fitness trainer, real estate agent, etc. ); written to attract leads. For local services targeting businesses -- written to attract leads. The value here is seriously over-the-top. 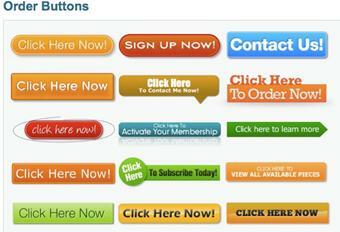 Just one of these complete web templates would run you in several hundred to several thousand-dollar range. (Go ahead get a quote from a successful copywriter with a track record and see.) And don't forget you can continue to return back to them again and again so the value is even greater. The CopyDoodles® Pack -- you'll get 50 proven, hand drawn doodles and call-outs to make your sales copy really stand out. With a few clicks of your mouse, CopyDoodles instantly transforms your marketing so it grabs more attention and receives the response it deserves. The CopyDoodles family includes unique, handwritten graphics, comics, templates, and more to stand out from the plain vanilla marketing most business owners create. CopyDoodles Access Club Members have exclusive access to over 7,000+ CopyDoodles in all colors, 500+ CopyComics, downloadable handwritten fonts, CopyGenerators for creating custom content, monthly done-for-you marketing templates and more! You can choose from our library of tools, or create your own, right down to the taglines on each and every one of our comics. original graphics pieces for you too. Those include original bullet points, guarantee bursts, order buttons, etc. so you can easily mix & match graphics between the copy packs to create original looks for your letters. With Instant Sales Letters® , you'll get all of this and more guaranteed to produce results for you, every time you send them out. And it doesn't matter if you own a professional practice, service company, retail store, restaurant, or even sell business to business - these letters will add your bottom line right away. Well, realize that this collection of sales letter templates could easily sell for thousands of dollars. In fact if you asked a top copywriter, like myself, to produce 65 sales letters for your business or 19 different web templates, you'd be charged in the neighborhood of $25,000 to $50,000.00, not including royalties. (I currently charge a minimum of $10,000.00 per copywriting project -- and that's for the really small jobs). So at a bare bones minimum you're getting thousands and thousands of dollars worth of powerful sales letters at your disposal. But I'm not going to charge you anywhere near that amount or even my minimum project price. In fact, your total investment for all these money-making, fill-in-the-blank sales letter templates is just two installments of $49 each. The money you'll earn as a result of these proven letters can very easily pay you back hundreds (probably thousands) times your meager investment. So what's the catch? Why am I practically giving these letters away? Well, it's really quite simple. Since you're accessing these directly from the Internet I have no inventory and no fulfillment costs. I don't need to pay anyone to take the orders over the phone (though, you are welcome to call me at 301-738-2190 to rest assured that I am a real person). This way I can pass along my cost savings to you. So you win and I win. This manual actually started out just as a personal resource to use whenever I sat down to write copy for a client or my own company. In fact, I really wasn't planning on making this available until a fellow marketer pleaded, "I gotta have a copy!" 133 Magical Openings That Makes Readers Beg For More. Never again be stuck on how to start a letter. Your opening is one of the most important parts of the letter, that's where readers decide to keep reading or just toss your letter. 333 Greatest Selling Words and Phrases. Certain words and phrases have been proven over and over again to produce results. Now, you'll have a ready-reference of tested words and phrases for your next marketing piece. 226 "Bucket Brigade" Copy Transitions and Connectors. This is my absolute favorite section in the entire manual. And you'll get 226 ways to smoothly and seamlessly connect every paragraph. This section alone is worth your admission price. 55 Powerful Fill-In-The-Blank Bullet Templates That Sell! Powerful bullets make sales letters sizzle! And you'll get dozens of quick and easy ways to create selling bullets. 22 Powerful Ways to State Your Guarantee. 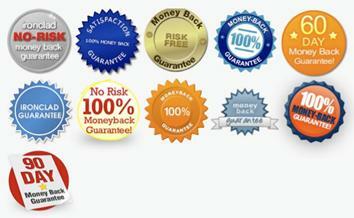 A well-worded guarantee can multiply your sales. It's true. And instead of falling back on "satisfaction guaranteed", you can take advantage of these proven examples. 31 Closings That Make Prospects Whip Out Their Wallets. Here's the part where most letters totally wimp out -- it's not enough to just write "call today" because people won't. In this section you're handed 31 of the most profitable examples of how to close your letter for maximum results. 32 Compelling P.S.s That Make Prospects Buy. Your letter's P.S. is critical. That's your last chance to turn a prospect into a customer. And now you've got 32 tested samples to use for your next sales letter. This comprehensive guide includes all the openings, bullets, selling words, phrases, copy connectors, guarantees, closes, and PS's you'll ever need to create profit-pulling salesletters. Bonus #2: Advanced Guide To Creating Jaw-Dropping Offers That Prospects Can't Resist! What exactly is your offer? It's more than price, that's for certain! Your offer includes payment options, quantity of product for price, bonuses, guarantee, and urgency drivers. One of your new favorite checklist resources will be all-new 'Customized Marketing Campaigns' report detailing how to make the right offer at the right time to prospects and customers. What's more, it includes 19 examples of proven offers you can use right now. "I'm a direct response copywriter by trade. I've generated millions of dollars in cash flow for my clients. I know good writing when I see it. Your letters are not just good, they're excellent. I purchased your stuff out of a need for efficiency. You've got everything templated and ready to go. You saved me hours and hours of work, and your letters are as good or better than what I could have written on my own. And then there are all the bonus materials!!! Absolutely a fantastic product that every marketer should have." "Your Instant Sales Letters Templates have already paid dividends for me. For example, I have just used your Testimonial template and was swamped with excellent replies." "After a few attempts of writing my own Sales Letter I let a few friends and co-workers read them and I got a mediocre response. Once I down loaded your "Instant Sales Letters" I simply put in my information, let a few of the same people read MY NEW LETTERS and suddenly I was a GENIUS at writing letters. (I reluctantly had to tell them that it wasn't my writing but yours, but they still thought I was pretty smart for using the "Instant Sales Letter" templates) Thanks !! Yanik"
Learn the secrets to branching out into direct mail promotions! Includes secrets to renting mail lists, writing an attention grabbing letter, and printing and mailing it for windfall sales. Want to know the fastest way I always recommend to grow your business? It's got to be having others endorse you. You get to tap into the massive amount of goodwill, credibility and reputation others have built . This series of secret fill-in-the-blank letters give you the keys to the kingdom on how to approach and create ultra profitable joint venture relationships. 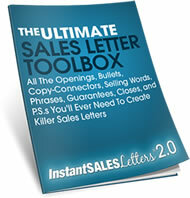 "The "Instant Sales Letter" templates will save me a lot of time and effort. I will be able to use them on regular basis for all aspects of my marketing. They are great!" "I have received your Instant sales letters and have immediately put them to use, the first being the request for testimonials and it really works. They are very easy to use and I am sure I will be using all of them regularly." Well, there you have it. With these 4 bonuses, and the Instant Sales Letter Templates® and Web Templates, you've got a complete system for creating your own winning sales letters and websites — right now! Together these four free bonuses are worth more than triple your investment in the Instant Sales Letter Templates -- but they're all yours absolutely free when you order right away. If you aren't 100% satisfied - I don't expect...or want...to keep your money. Simply send off a quick email to me and I'll happily refund your money in full. But even if you decide the letters and web templates aren't for you - the free bonus gifts are yours to keep regardless, as a "thank you" gift from me. That means you can't lose no matter what! That means you can try out all the sales letters at my risk, while you see if they work for you or not. And if they don't produce, I honestly want you to ask for your money back. And I'll let you keep the free bonus gifts as my way of thanking you for giving the sales letters a try. There is absolutely no risk, whatsoever on your part. The burden to deliver is entirely on me. If you don't produce immediate profits using these instant sales letters then I'm the loser, not you. "Your helpfulness and graciousness has been most appreciated. Your customer service has been extraordinary and you have made me feel humbled to ask for a refund. thank you so much for your help. You Really Can't Afford Not To Invest In These Instant Sales Letter Templates! It's easy to get started right away. Just click here and you can have immediate (and unlimited) access to all of the Instant Sales Letter Templates right on the spot. You just fill-in-the-blanks, right on your own computer. No retyping and no recopying. It couldn't be easier or faster. Get ready to create a flood of new customers, get them to buy over and over, and refer others - just by using these powerful sales letters. Why not take 2 1/2 minutes now to create a powerful sales letter for your business? Order Now! P.S. Just think! "You'll never again suffer through the pain and hassle of trying to write a powerful sales letter yourself. Or pay big bucks hiring a top copywriter. Now, you can get everything all done for you, practically handed to you on a silver platter. You simply fill-in-the-blanks...and you're done in about 2 1/2 minutes -- flat! Order now through our Secure Server, and get instant access! * IMPORTANT: Some of these testimonials include results from my customers. NONE of these results are typical. Why? Because most people, even when they PURCHASE incredibly powerful business advice and learning tools, don't do anything with the information. That's right, the typical result is NADA because people are too busy, too distracted or even too lazy to turn even the best resources into results. So if you're not going to USE these tools after you buy, save yourself the money and the trouble. But if you do buy and apply yourself, you could be in for very ATYPICAL results.